Modern medicine doesn’t offer a natural cure of Keratosis Pilaris but homeopathy does and you can see improvement within 6-8 months and full cure within 10-12 months, in most cases unless there is a familial trend e.g. mother & grand parents had it, then the cure can take much longer as the disease has moved to genetic level. If you have skin on legs, arms or buttocks which looks rough, kind of like having goosebumps all the time, also called chicken skin, then you most likely have what is commonly called Keratosis Pilaris. It’s not contagious, it’s not an infection. It just looks unsightly. If you are looking for natural cure of Keratosis Pilaris, look no further as homeopathy can cure it. The temporary & immediate answer is to apply alpha-hydroxy lotions e.g. Amlactin which will suppress this condition as long as you apply it. It will come back when you stop applying the lotion. Another temporary solution is to eat homemade yogurt, the healthy bacteria of yogurt improve the skin texture but don’t cure it. What Keratosis Pilaris is indicating is a deeper lying problem in your body and as part of the safeguarding mechanism, the body is throwing it out from the inside to the outside so that you can know about it and treat it. 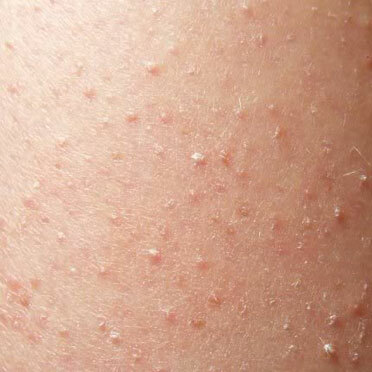 Keratosis Pilaris is genetic and will go from one generation to the next, worsening with every generation. So what is the natural cure of Keratosis Pilaris? There is no treatment for it in modern (allopathic) medicine. Homeopathy can cure it! A well selected homeopathic remedy can cure this situation in a few months depending on how deep & long standing the issue is. For an issue which has been transferred from parents or grandparents, it can take longer. If you have Keratosis Pilaris, you are lucky that your body’s healing mechanism has chosen to throw the ailment out of the body so that your internal vital organs are saved, you can see the outside ailment and treat it to enjoy great health. Treating skin diseases by external methods will only drive the disease deeper. It’s the same as killing the messenger of bad news. Homeopathic treatment of acanthosis nigricans requires taking a complete & detailed history of the patient and choosing one remedy based on his personality. Doing this requires deep understanding of homeopathy otherwise you will not be able to choose one remedy out of over 2500 remedies. You can read our FAQ section to learn about further details of homeopathy and your treatment options.